Jason Longbrake gave the keynote address at graduation. Swanton Superintendent Jeff Schlade takes a panoramic photo of the Class of 2015. Senior Class President Alaura Fetterman welcomes everyone to the 119th commencement program for Swanton High School. Brandon Alvarez gave the valedictory. 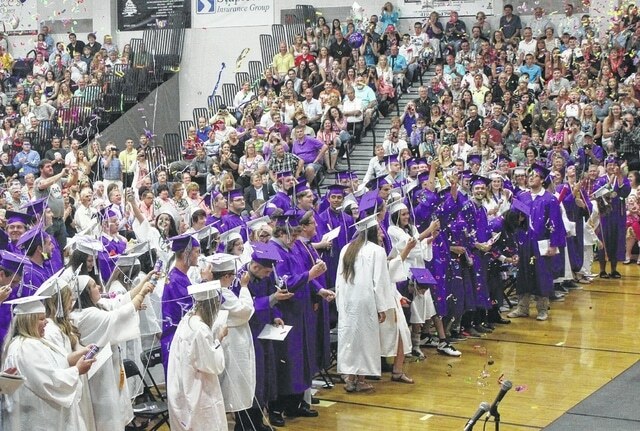 The Swanton High School Class of 2015 celebrates after moving their tassles. The 119th commencenment program for Swanton High School was held Saturday in the gymnasium, with graduates told to remember the past. Jason Longbrake, a former history teacher, gave the keynote address. Throughout the emotional speech, Longbrake asked the graduating seniors not to forget their time at Swanton and the people they have known along the way. “You may not appreciate it at this moment, but you come from a caring, compassionate community,” he said. Senior class president Alaura Fetterman welcomed everyone to commencement, and Brandon Alvarez gave the valedictory address. He told classmates that money and power do not signify success, and thanked teachers at the conclusion of his speech. Also during the program, the senior chorus performed, “Good Riddance (Time of Your Life).” The Swanton Concert Band Senior Song, “With Quiet Courage” was also performed.